An admitted bookworm, designer Olympia Le-Tan is best known for creating one-of-a-kind handbags resembling literary classics such as Catcher in the Rye, Doctor Zhivago, and For Whom the Bell Tolls. Olympia Le-Tan designed to look like a bag that looks like a book invites the reader to discover the scope of the multifaceted French designer s creations from her signature minaudieres to her quirky ready-to-wear line and seemingly endless collaborations with fellow artists and designers. Born in London and raised in Paris, Le-Tan, whose father and sometimes collaborator is celebrated illustrator Pierre Le-Tan, got her sartorial debut at the age of nineteen. After working with Karl Lagerfeld at Chanel, Gilles Dufour at Balmain, and deejaying for the likes of Kirsten Dunst, Yves Saint Laurent, Balenciaga, and Purple magazine, she has earned the image of a prolific designer and worldly collector with a finger on the pulse of fashion. 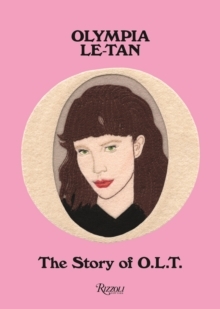 This book offers a playful and autobiographical glimpse into the world of Le-Tan and the inspirations behind her eclectic designs. Filled with candid photographs and charming illustrations, Olympia Le- Tan presents a whimsical look into one of the most creative designers on the scene today.